BRE developed and manufactured a miniature earth pressure cell which can be pushed horizontally from a vertical borehole to measure vertical and horizontal stresses. Engineers need to know the magnitude of stresses in the ground as they can have an important influence on the behaviour of engineering structures. 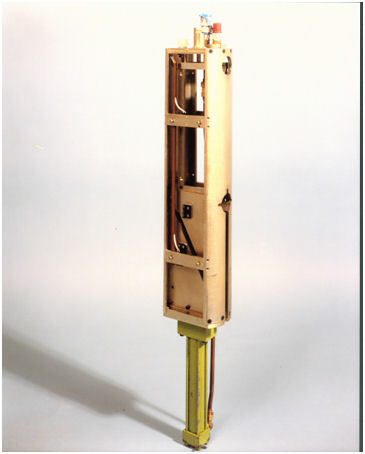 The BRE miniature push –in pressure cell system (Figure 1) has been designed to be jacked horizontally into soft clay from a vertical 0.15m borehole. It consists of a 2.4 mm thick oil filled envelope attached to a wedge shaped slim body. The measuring area is 44 mm in diameter, an overall length of 115 mm and a maximum thickness of 20 mm. The oil filled envelope is connected directly to a pneumatic transducer incorporated in the flat body of the cell. Applied external pressure is transmitted to the oil in the envelope and measured through the transducer. The placing device is cylindrical and incorporates a double acting hydraulic jack that is operated from ground level (Figure 2). The cell is loaded into a breech across the diameter of the machine. A breech ram pushes the cell out of a port in the side of the machine. Steel spacers are held in a magazine and are pushed in behind the cell. The operation is repeated until the cell is some 0.6 m from the side of the borehole. The cells are monitored using a pneumatic readout which supplies gas at a constant flow rate. 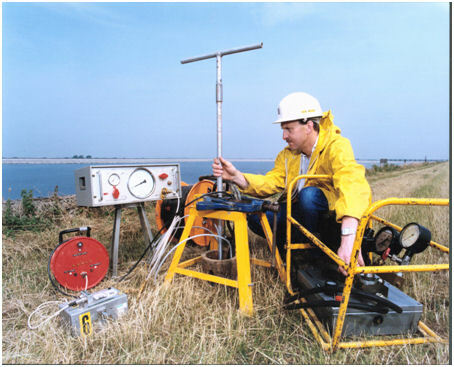 Pressure measurements are taken at increasing intervals of time and the results are plotted to a logarithmic time scale to observe the dissipation of the excess pressure generated by jacking the cell into the soil. Dissipation times typically vary from hours to several weeks. Old embankment dams have a central soft clay core and the BRE cell has been used to make a full examination of the stresses and pore pressure at any depth in the core, Figure 3. Another application is to measure stresses under a loaded pad or foundation. The miniature cell is installed before applying the load either via a borehole outside the loaded area or with a large loaded area, through the area itself. Over the period 1986-91 a total of 43 minature cells were installed at sites throughout the United Kingdom. Although not all cells have been monitored regularly, some of the early installations have continued to operate satisfactorily over a number of years. Subsequently, around 200 cells were installed on various research and commercial projects over a period of around 15 years.